To find the hidden trail. Seek the way that height has found. Is fine but no avail. Eyes that fly bring new travail. The chamber continues to crumble all around Richard and his companions, threatening to bury them in Cobra's Keep. As Richard turns to face his comrades, he catches sight of a lizard tail disappearing inside a large crack in a nearby wall. He shouts to his friends and points out the crack, and they waste no time crawling through the rough tunnel inside after the lizards. The interior of the tunnel is still intensely hot, and the rough edges and sand force them to dig their way partally through. However, the tremors eventually grow fainter and sand morphs into more solid ground. Soon, the four friends emerge into daylight on a hillside, near mountains on the other side of the desert. A loud rumble catches their notice and they all turn to face the now distant Sand City. A large fireball explodes above the city, destroying it completely and leaving only smoldering ashes. Kika turns to Richard and says that she'll now leave the group so she can take the lizard forces to the Ancestral City, where they are needed. She then lowers her voice to a whisper and warns Richard about Orkan, who was acting strangely, and whom Richard should keep an eye on. With those words, Kika gathers the lizard forces up and leads them to the Ancestral City to join Juroot and his bird forces. With Kika gone, Richard wonders about Kika's warning, but doesn't see anything wrong with the pigman. After the trio head down the hillside, Melek reads the newest prophecy from the Book of Prophecies. Richard notes the first part has already been fulfilled and gives the propechy another read when the ground beneath them begins to shake. The group turns and sees a large mound building up in the soil behind them. The mound grows with each passing second with the sounds of digging clearly heard underneath, and the hill suddenly explodes, revealing a monstrous black creature underneath. 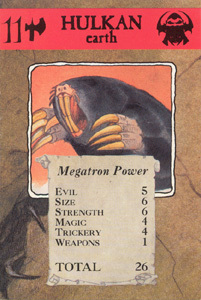 Melek quickly recognizes the beast, identifying it as Hulkan the mole monster. He reveals Hulkan's blindness and heightened senses of smell and hearing, as well as the deadliness of his claws and teeth. The trio ties to tiptoe away from Hulkan without alerting him, but Hulkan's nose flare at their movements. Knowing hiding was useless, the group tries running instead, but quickly found themselves floundering in a bracken - making matters worse was Richard still carrying the Book of Prophecies. Realizing they might have to fight, Richard draws Juroot's dagger and calls for Orkan to distract Hulkan. To Richard'ssurprise, Orkan turns away and tries in vain to run through the bracken. Richard quickly orders Orkan to return. At this moment, Richard hears chuckling and turns back to Hulkan, who was now surrounded by an army of small brown figures. 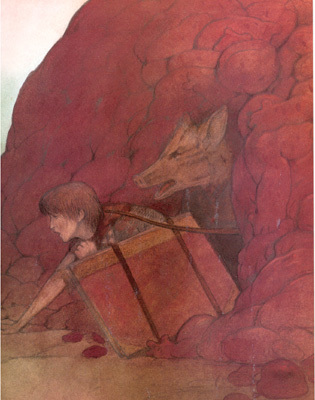 He watches as the creature picks up clay in the ground and uses his clawed hands to mold little men, which spring to life and begin to give chase. Horrified, Richard struggles after Orkan while Melek gets his leg caught on a piece of bracken. The figures, on the other hand, have no trouble making their way through the bracken and easily catch up to Richard and Orkan. 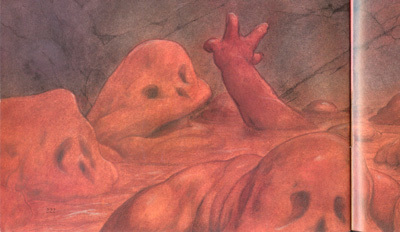 The little mud men quickly surround the two and cling haphazardly to each other, forming a wall of dirt in front of them. 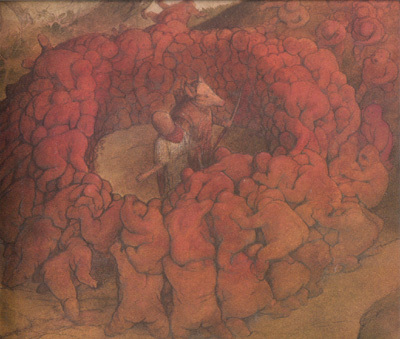 By the time Orkan and Richard reach the wall, the mud figures begin forming a wall behind them, and soon the wall grows to become a sphere of encasing mud. Richard's attempts to hack the mud wall with his blade prove to be useless. Meanwhile, Melek manages to free himself from the bracken and sees his companions' predicament. He thinks for a moment before getting an idea and climbing a nearby tree, where he is able to look down at his entrapped friends. As Melek scans the area for water, Richard clasps Golan's amulent and asks for help; Golan replies and informs Richard to seek out water. Richard cannot see any water over the enclosing mud men wall, but Melek manages to spot a stream nearby. Suddenly, Melek notices something in the mud wall: an opening that hadn't yet been closed. As he scrambles back down the tree, he calls out to his friends and directs them towards the hole. Hulkan, too busy making his mud men to finish the mud circle, doesn't notice the hole in the wall, but the little figures do. They try to untangle themselves to close the escape, but Richard and Melek manage to get out before they can do so. With Richard and Melek out of the mud enclosure, Melek quickly waves for his friends to follow him. The mud men quickly give chase, and soon Hulkan roars in anger at discovering the loss of his prey. 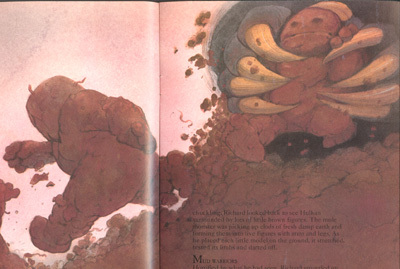 The mole monster dives into the ground and tunnels after them furiously, but the ground has grown rockier and forces Hulkan to surface once again and allow his army of mud men to give chase. Some of the mud men catch up to Richard and try to slow him down by flinging themselves onto his leg, but they have little effect and the trio eventually reach the river. Despite Orkan's reservations, the trio launch into the river from a dangerous height. They land safely in the thankfully deep waters, though Richard does injure his leg. The mud men, upon reaching the river's edge, hesitate before flinging themselves into the river as well to give chase. In the river, the trio are immediately caught up in some powerful rapids and dragged down through some currents. Thankfully, they manage to reach the opposite bank at the end of the gorge, though Melek needs to be rescued by his friends for taking the heavy Book of Prophecies back from Richard before jumping into the stream. Before they can relax, Melek points to where they had come from, and Richard and Melek look to see the display of countless mud men leaping into the river in pursuit. Thinking they would have to make a last stand, Richard readies himself for the onslaught. But there is no need: as Melek excitedly points out, the mud men are dissolving in the river as soon as they hit the water. Within a matter of moments, every single mud man had thrown itself into the river and melted away, leaving a thick slop that was carried away by the currents. With Hulkan and his army no longer a threat, Richard and his companions begin making their way up the bank, which soon merges with a forest. As the trio walk through the trees, Richard turns to Orkan and presses him about his earlier behavior, about running away from Hulkan. Orkan ignores the question and acts dodgy. Richard realizes Kika was right in that something has happened to Orkan, but before he could think any further about the matter, he hears a familiar drone in the air. The others hear it as well and the three begin running, knowing all too well the sound of attacking Grapfrits. Hulkan is a monstrous mole monster who dwells on a large soily plain known as Hulkan Heights. While he is blind, he has sharp hearing and a keen sense of smell that let him know when prey is close. His teeth and claws are enough to shred meat to pieces and he can burrow through the ground and lightning speed, but his preferred methods of catching his prey is using magical means to create an army of little mud men that trap creatures by surrounding them with makeshift mud men enclosures. "The trio stared whide-eyed as a sleep, black shape begain to work its way out of the top of the mound. Slowly, more and more of the creature emerged. 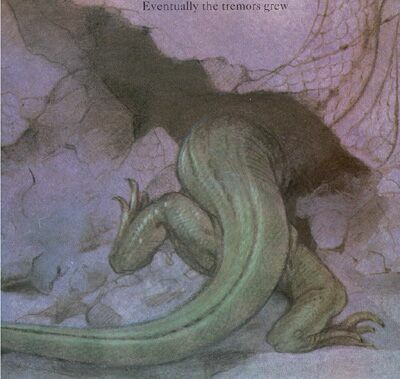 Its glossy black coat shone in the sunlight, parting at the mouth to show long, spade-shaped teeth. Two stubby arms ended in sharp-clawed paddle-like paws. As far as the three could see, it had no eyes, but there were two minuscule nostril sthat twitched, sniffing the air. On either side of the smooth head were tiny holes that might have been ears." 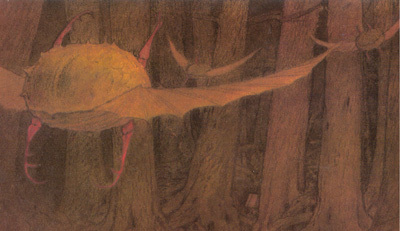 One of the traditions of The Ancestral Trail is to show creatures that are merely enlargened, monstrous versions of everyday animals seen in the real world, and volume fourteen of the series continues that tradition. 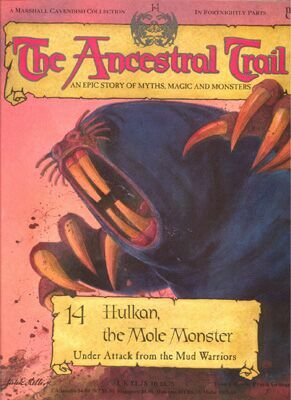 Instead of another giant bug a la Baal the giant spider or the scorpion guards of Sand City, however, we get Hulkan the mole monster, joining the Giant Mammal Club to give Enlil some company. Hulkan is a rather interesting creature in that while he certainly has the means to take prey head on (his teeth and claws certainly indicate so), he prefers to capture his prey indirectly by using an army of mud men to corral them. While perhaps unusual, this can be seen as a way for Hulkan to protect himself from being overzealous. If he can contain his prey in a small space, he doesn't risk as much possible injury to himself upon going in for the kill. Also in this volume, the identify of the third pod is revealed near the end of the volume, when Richard was pressing Orkan for an explanation of his actions: "Richard asked again, willing Orkan to be all right. He felt a sense of justice run through his mind, as he recalled all the good things Orkan had done since they had met." The second sentence indicates the pod is the Pod of Justice, which happens to be the Life Force Pod of Juroot. Speaking of Orkan's behavior, it has certainly added a new dimension to the story. 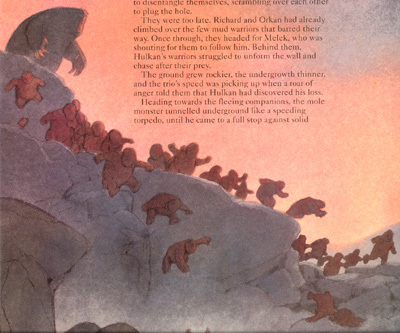 What would've happened if Orkan hadn't been affected by the amulet around his neck when Hulkan attacked? Would he have not run away, and thus would Richard and his friends have faced Hulkan head on? And how will Orkan's behavior affect things later down the road? Only future volumes can tell. Finally, there's one small amusing note to mention concerning this volume: while in the previous volume Dragora was clearly identified as female, the three-headed cobra was accidentally referred to as a male in the following segment: "...leaving only a rising column of sand and ash to mark the grave of Dragora and his scorpion guards." "Over here! The lizards have found a way out!" "Watch out for Orkan. I think something's happened to him. I don't know what...maybe it's the effect of that scorpion sting." "Hulkan! 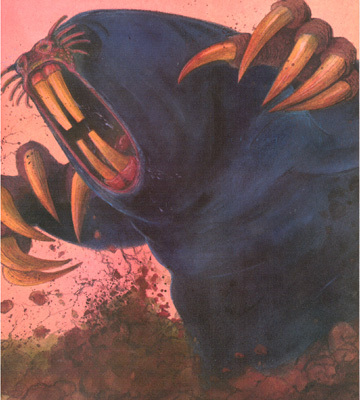 The mole monster! I've heard about him. He can't see us, but he can smell us, and he hears every sound. His teeth and claws can rip us to shred." "They're dissolving. Look! They're melting away as soon as they hit the water." "Why didn't you help me against Hulkan? You ran like a mouse. What's happened to you?"